Toronto condos get a bad rap for bland and homogenous design, but there are plenty of exceptions spread across the city. 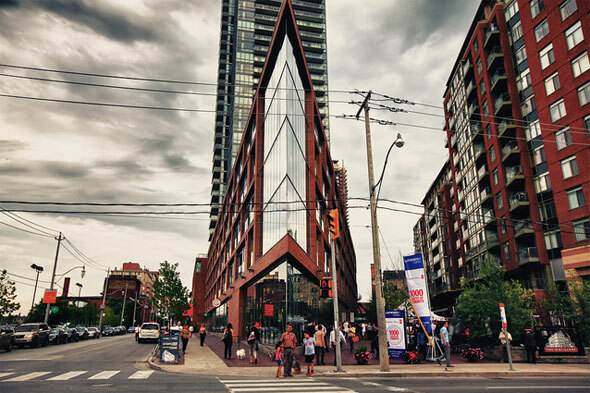 From mid-rise buildings to soaring towers, there are a few that push the envelope architecturally and aim to enrich Toronto's built legacy in a meaningful way. These condos should be held up as examples for architects to follow as the vertical boom continues in this city. Here are my picks for the most stunning condos in Toronto. We're still waiting on the stunning Phase 3 of the River City condo complex, but the first two have already cemented the development as one of the strongest bits of residential architecture this city has seen. Saucier+Perrotte and ZAS Architects are on their game here. CORE Architects' 500 Wellington is what so many Toronto condos are not. It's scaled well to the street and neighbouring buildings, the layout of each unit varies considerably, and you could imagine that this city would be a better place if there were more buildings like it. 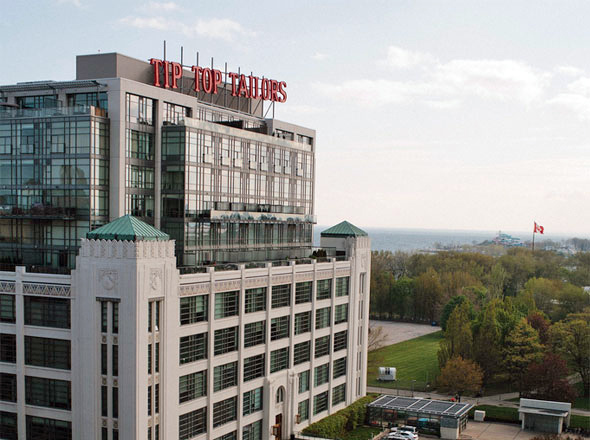 The Tip Top Lofts aren't just worthy of mention on account of the original building, but the seamless manner in which the additional six stories were added by architectsAlliance in 2002. This sets the bar for historical conversions right down to the retention and re-installation of the original sign. The sprawling two-storey ceilings in many of the units are a marvel of interior design. 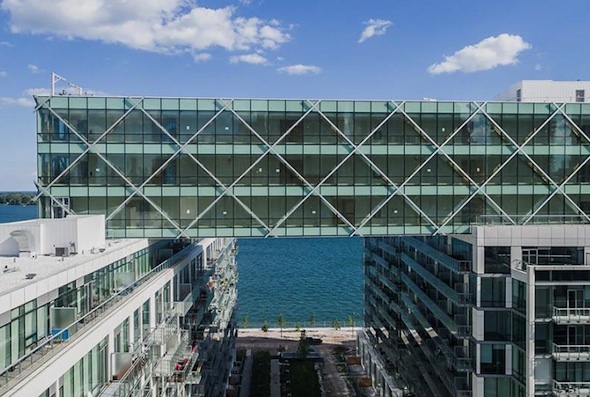 Pier 27 takes Toronto glass box condo trend and turns it on its side. In a city that's notorious for playing it safe, these waterfront condos from architectsAlliance are both eye-catching and smartly designed to prevent that sense that the lake has been cut off for those travelling along Queens Quay. 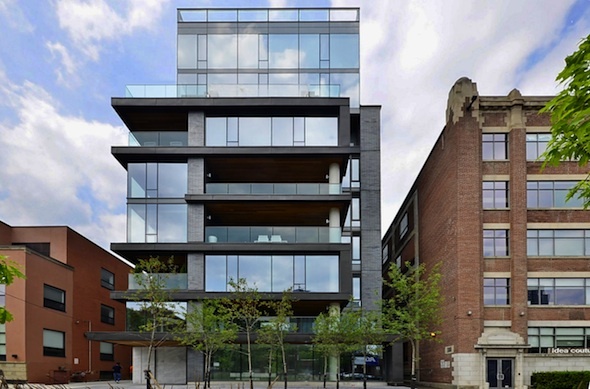 Peter Clewes has designed many condos in Toronto, but none are so elegant as his homage to Mies van der Rohe. 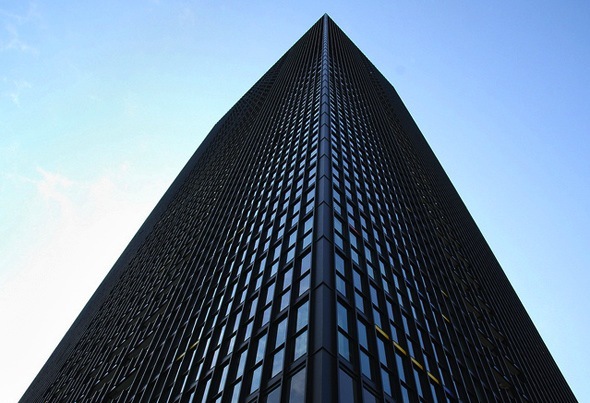 X Condominium is 46 storeys of black steel and glass that serves as a reminder that there's an austere beauty to the simplicity of the International Style. 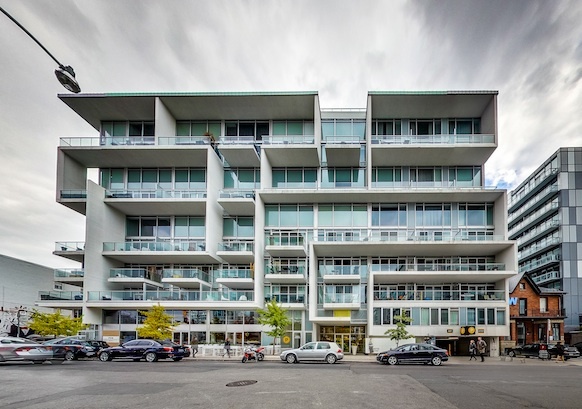 This Quadrangle-designed mid-rise condo on Dundas West angles every floor except the fifth away from the street, which gives it a fan-like appearance that cuts back on its impact at street level but retains a presence from a viewing distance. It's an excellent example of how architects can get creative with project's of this size. 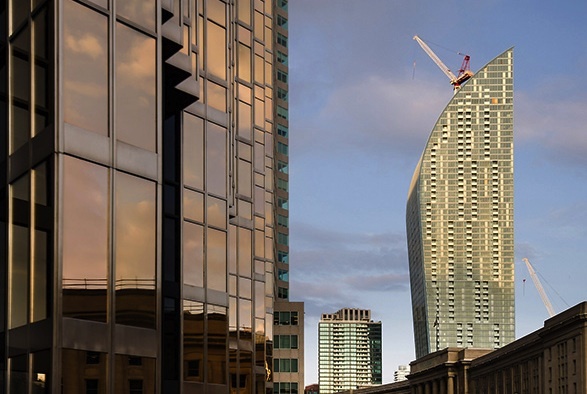 There's still a bit of work to be done on Daniel Libeskind's L Tower, but it's already a highlight of Toronto's skyline. 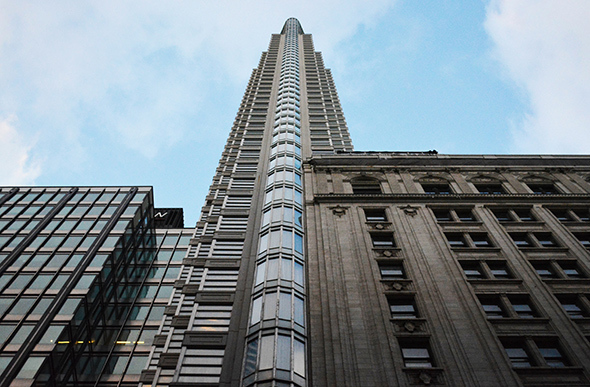 Rising above the Sony Centre, its arched upper floors make it appear as as a knife in the sky. It's also a reminder that glass condos can be designed with flare. Formerly home to the Dominion Bank (1914), the Stanford Downey Architects Art Deco-inspired condo and hotel rises above the existing heritage structure, which still serves as the venue for private dining function in the former vault and grand banking hall. The first condo in the Distillery District features a unique podium design that terminates as a sharp point and introduces the neighbourhood from the west side. 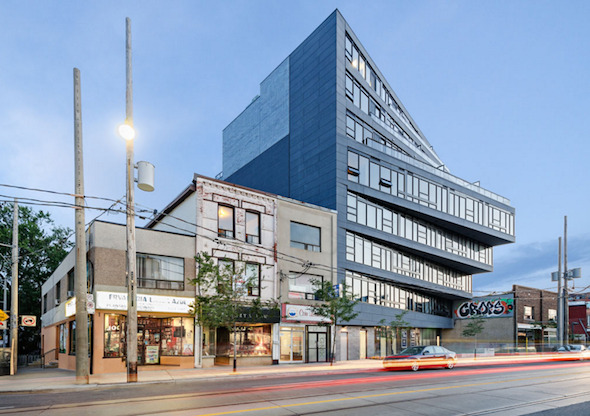 The tower isn't exactly a showstopper, but what's so successful about this project is the way that the lower levels integrate with and enclose the neighbourhood from which the condo rises. Never mind that it's officially referred to as Seventy5 Portland, an unnecessary mashing of numbers and letters if there ever was one, this CORE Architects designed 11 storey condo does wonders with concrete, featuring cantilevered balconies and massing elements that shift back and forth from the main building. It's the antithesis of a boxy glass condo. What did I miss? Disagree with my selections in the comments. Photos by Urban Capital, CORE Architects, gable.mak, architectsAlliance, Quadrangle Architects, Lori Whelan, bukharov, Peter Francis.